As 2017 comes to a close, it’s worth remembering that America’s mountain of debt continues to grow. 1. The deficit reached $666 billion. By many, 666 is known as the number of the beast in the Book of Revelation in the New Testament. In this case, $666 billion is the 2017 federal budget deficit. That’s how much more Congress spent in 2017 than it took in from taxation. Of total spending in 2017, which topped $3,982 billion, Congress borrowed 17 cents on every dollar. 2. The debt reached $20 trillion. 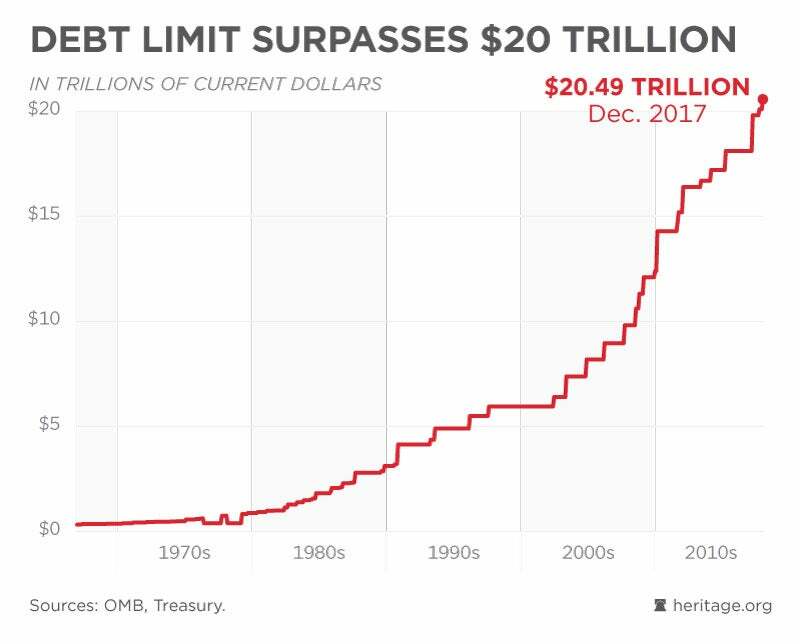 The year 2017 marked the first time the national debt exceeded $20 trillion. The debt reached this level in September when President Donald Trump struck a deal with House Minority Leader Nancy Pelosi, D-Calif., and Senate Minority Leader Chuck Schumer, D-N.Y., to continue funding for domestic and defense programs, provide relief in light of Hurricane Harvey, and suspend the debt limit. Since then, the debt limit was reinstated at $20.4 trillion in early December. 3. Social Security spending reached $1 trillion. This year marked the first time that Social Security spending on the Old-Age, Survivors, and Disability Insurance programs topped $1 trillion. Social Security is the single largest federal benefit program. It has held this rank since 1993, when it first surpassed spending on national defense. Without reforms, both Social Security programs are projected to reach insolvency by 2034. Federal law dictates that Congress must pass a budget to fund national defense and domestic programs that are categorized as discretionary spending, each year by Sept. 31. Three months into fiscal year 2018, which began on Oct. 1, Congress has already passed three temporary continuing resolutions. The last continuing resolution was passed on Dec. 22 and sets up the next funding deadline on Jan. 19. Continuing resolutions are a flawed way of funding the government—but when the alternative is a potentially $200-plus billion spending increase from a deal to breach budget caps that are currently in law, a continuing resolution at current funding levels is the lesser evil. 5. First Trump budget was proposed. The president released his first official budget proposal in May 2017. The “America First” proposal would balance the budget within 10 years, prioritize national defense spending, and reduce spending on nondefense discretionary programs by more than $1.4 trillion over 10 years. It would also implement policies to reduce the reach and weight of the federal government by eliminating wasteful and duplicative programs, and by rolling back harmful regulations that reduce individual freedom and hamstring the national economy. But Congress has not given the president’s proposals the serious consideration that they deserve. This year, Congress broke several budget number records and kicked the can on funding for the federal government into 2018. This, despite the fact that America’s new president introduced a bold budget to reduce the size and scope of government—including many ideas embraced by Heritage Foundation policy experts. Federal spending is on an unsustainable upward trajectory, driving national debt to economically harmful levels. This comes with consequences that will be felt for generations in the form of lost opportunity and less prosperity. Now that Congress and the president have achieved significant tax reform, they must work together in 2018 and beyond to realize fundamental budget reform. If they fail, the gains just realized on taxes could be too soon undone as out-of-control spending exerts pressure to raise taxes in the not-too-distant future. As deficits are projected to reach $1 trillion annually before the end of this decade, Congress and the president must not delay to cut spending, right-size the federal government, and reform unsustainable entitlement programs. Succeeding at that is critical to restoring America to greatness.